Are you tired of finding out the best minimalist premium WordPress theme? or confused which one to choose from hundreds of themes? Here I have listed best of best premium minimalist WordPress themes chosen from those hundreds of themes available in the market. Here are the lists off 50+ best minimalist premium WordPress themes. Divi is very stylish, minimal, visually refined WordPress theme that meets your requirement. According to the BuildWith.com, Divi is most popular WordPress theme in the world. Divi is well structured, highly modern, flexible, user-friendly, and feature rich theme which is designed for multipurpose. Samurai is minimal blog theme. This responsive theme is best to use for blog, travel, informative and lifestyle coaches. 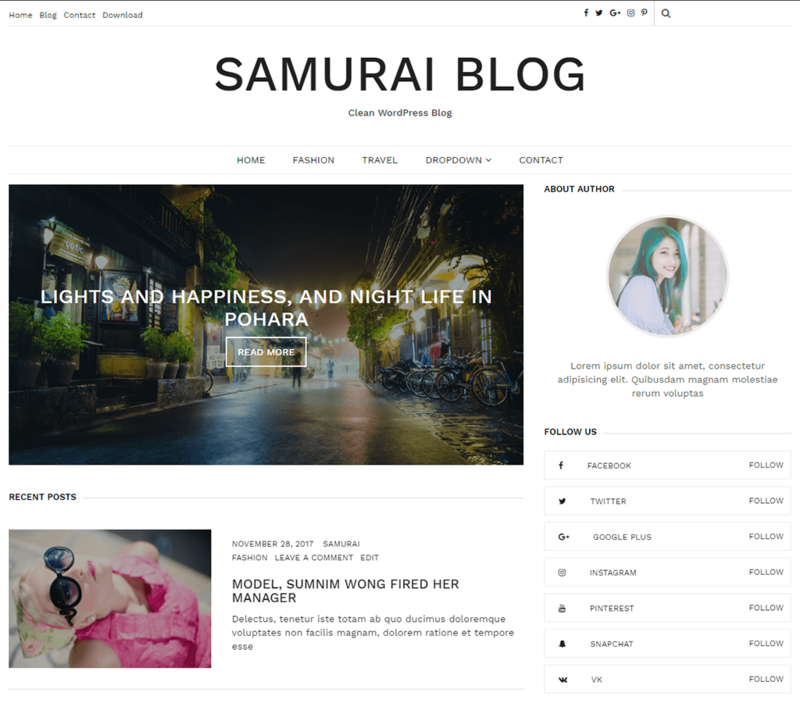 It comes with an option to change the color of an entire site, author profile widget, social links to connect with social networking sites and more.Samurai Blog Theme Contains Related Post, Featured Section.It Supports Popular Plugin WooCommerce, Contact Form 7, Easy Digital Download. Ranger is free and premium WordPress theme designed for personal blogs, magazines, and creative websites that are seeking clean, polished and minimal design features. Ragnar comes pre-built with a selection of 6 unique layouts for your blog and homepage needs. You can select your blog layouts with sidebars, or full-width layouts — both layouts include featured posts and about widgets underneath the menu navigation. You can preview each of the layouts on the live demo page, though design layouts are not limited as you can create custom layouts based on content and layout blocks provided by the Ragnar theme. If you need a Grid Layout presentation, look no further as Ragnar will happily accommodate those customers who prefer this kind of layout. Hestia Pro is a minimalist and elegant theme, having multiple purposes. The design is flexible and can be customized to fit your needs very well. A material design theme for businesses, startups, arts, e-commerce, portfolio and more. The beautiful one-page layout, completed by the parallax scrolling and elegant sections, will make your content stand out easily. Hestia looks simple yet modern and offers a beautiful grid portfolio and a catchy online shop. Apart from that, it comes with parallax scrolling, one-page layout, and subtle animations. If you are looking for a design-driven, aesthetically sophisticated & technically proficient portfolio WordPress theme, then Adios is built for you. It is entirely responsive, and it works well on tablets, smartphones, and desktop computers. With 9+ homepage layouts and a stack of portfolio options, you are guaranteed to get a bang for your buck. You can literally build portfolio site of any niche with this stunning theme. This is not only the best way to show off your creative style, but also a flexible platform to market your wares & impress your clients, too. It is, of course, retina ready and boasts super high-resolution graphics. Theme documentation is very extensive and informative, enough to turn any newbie into an experienced user. The same principle of adaptability applies to devices as well. So many pieces of great work deserve a beautiful online portfolio. So Eclecticon theme is here for you. It is a portfolio theme for WordPress, will help you with that.An original black-and-white minimalist WordPress theme for great portfolios and photography collections. This theme looks so simple and elegant, provides an upright menu, an author box, and an awesome project display, which acts as a slider. Woga is stunning WordPress theme designed primarily for yoga and gym related website. However, the theme can be customized and used for personal, niche blog sites too. Woga is feature-rich theme that comes with lots of exciting features in it. Legenda is a flexible template with a clean and fully responsive design, based on Bootstrap. Perfect for corporate websites, blogs, etc. It is fully compatible with WooCommerce plugin.Legenda is a professional, sleek and powerful WordPress WooCommerce template that provides an elegant solution for those who are going to sell products online. You can get a bunch of Lagenda themes package in optimum price.Try it out once! Aurum – is a minimalist WooCommerce theme that will give you and your customers a smooth shopping experience which can be used for various kinds of stores such as boutiques, bookstores, technology stores, jewelry and other types of web shops. It is a beautiful, flexible and super fast theme. Imagery Pro is a minimalistic WordPress theme that puts your picture and a word front and center. Put your work, your photos, your words in the spotlight of the visitor. Imagery Pro offers a simple, centered (no sidebar) layout with the Featured image or Gallery slideshow at the top. Imagery Pro is perfect for anyone who wants to share their creativity and get more orders. Krystal is a professional business template perfect for your blog, small business, online portfolio, construction companies and creative agencies. It is a clean and modern design bootstrap WordPress theme nicely coded for easy customization. Krystal provides a great experience and impression to your visitors with aclean and elegant design. There is also a working ajax contact form in Krystal theme. Powered by most popular page builder Elementor you can easily create and edit pages. Krystal comes with 1 click demo import feature. Krystal is SEO friendly and mobile responsive too. Education Mind Pro is a convenient and intuitive education WordPress theme. It is a pliable platform for creating all sorts of websites especiallylly focused for educational websites. While this theme is ideal for educational institutions it is flexible enough to be used for corporations, professionals, creative digital agencies and portfolio websites. It is completely responsive and works on all devices and screens. Theme is capable of displaying relevant information in a user-friendly manner. It uses a clean code and HTML5 and CSS3 files for a great performance with appealing looks. Blog Express Pro is simple and minimalistic yet modern WordPress blog theme. It is simply suitable for personal or professional blog or content publishers. It has been designed to beautifully showcase pictures and text content and developed to be easy to use and optimized. As it is responsive and supports all modern browsers, it delivers better user experience across all sizes of devices. Theme supports the WordPress Customizer for all theme settings and enables to customize site as per your need and with live preview. It is a distinctive search engine optimized blog and will help you stand out from the crowd and create an impressive blogging site. Jevelin is a highly responsive WordPress premium multipurpose website theme. It’s a beautifully created theme with the aim of providing modern looks and performance. This theme is suitable for professional portfolio websites, landing pages, tech startups and other types of websites. Jevelin can pull them all off through a series of professionally designed demo websites and page templates for all sorts of purposes, each easily customizable through a completely visual interface that requires absolutely no coding experience or knowledge. Company Elite Pro is an elite, imaginatively manufactured business WordPress theme. In the event that you are wanting to make a powerful business site, look not any more far off than Company Elite Pro. This adaptable business WordPress Theme can change in accordance with any market claim to fame, and give the customer an accessible and normal interface. It intensifies your page’s execution & performance, showing to your customers that your association values quality and respect for detail. This is a topic that can suit any customer, not just those with bleeding edge programming data. With Company Elite, you may use your business page in order to fit your things. It has complete WooCommerce support, which is a winner among the most profitable WC themes on WordPress. It supports the making of master online stores, outfitting customers with an opportunity to assemble their pay stream. Lifestyle is magazine theme pack designed elegantly with three header and post layouts that make it suitable for multiple uses. Unlike other magazine themes, Lifestyle is lightweight, fast loading and with optimal performance. It is ideal for creating a sleek online magazine in different niches. It is highly customizable and well optimized for AdSense and other monetization methods. Horizon photography portfolio theme is a bold, minimalist, refined and clean photography theme. Designed for active photographers this theme will suit any event, action, sports, concert or real estate, photographer. Horizon portfolio theme is very visual making your photography the center of attention. Kalon Pro is a visually appealing feminine WordPress Theme with clean layout and elegant design focused on readability and user experience. The Theme comes with offers full customization options with multiple layouts, navigations, headers, styles and many top-end features to build a unique blog. With a striking, beautiful design and great typography, Kalon Pro will immediately set your website apart from the competition. Luka is a modern, ambitious photography portfolio theme for WordPress. This beautiful theme has a fine vibe of elegance and charm. Filled with delicate typography and decorative graphic elements. Luka will compliment your photography and bring the viewers attention to your work. Onero is a minimal WordPress Portfolio Theme for creative people with a lot of features. There also a great Minimal WooCommerce demo that can be used for the fashion shop. There is a great choice for minimal eCommerce websites. All the demo installation can be realized with one single click. Portfolios are amazing build with the latest modern trends. Onero uses some line icons that make the theme looking very clean and minimal. Onero comes with this advanced and full options panel but very intuitive and friendly. You can change any part of theme styling without writing a line of code. You can check also how responsive is your website directly from the live preview. Lekh is a creative and powerful premium WordPress blog theme for professional bloggers. The theme is best optimized for full flexibility and great functionality. It is packed with all the essential features and visually appealing design. It offers tons of customization possibilities and multiple options to let you create a complete blogging site with an ease. EightLaw Pro is a powerful feature-rich premium WordPress theme perfect for lawyers, law agencies, and other creative websites. It is cutting edge law theme with a clean and modern design. It includes all required features. Surya Chandra is a minimalist multi-purpose WordPress theme. It is a flexible theme suitable for agency, blog, business, corporate or portfolios. Powered by drag and drop page builder, SiteOrigin Page Builder, it is easy and straightforward for customization. It comes with multiple widgets with which you can create custom layouts with fewer efforts. For a quick start, sample demo content files are available in the theme enabling one-click demo import. With Multiple color schemes and font options provided in the theme allows you to setup site as per your targeted online presence. Blogism Pro is a tremendously intuitive, powerfully flexible, colorful and fresh, polished and professional, extremely responsive WordPress theme. It is suited to be deployed for a number of different websites and projects of all kinds but particularly well suited for blogging related websites. If you are looking for the minimal blogging theme then, it is what to need. You do not need to be a programmer in order to enjoy this amazing product, as it is very user-friendly. It is a theme built to satisfy the needs of the modern blogger, whether for casual and personal blogs or for professional, corporate and journalistic blogs. Clean Corporate Pro is a modern and minimalist corporate WordPress theme. It is clean, professional and interactive. It provides you with several simple yet modern features a corporate site might need. It has an elegant and catchy appearance that conquers you immediately. Every section has a professional design and well-structured information. It offers a relaxed approach to presenting your business which makes this theme an excellent choice for your business or corporate institutions. Total Plus is a Premium WordPress theme that has all things to create the website of your need. The theme hash all the necessary features that you will need to create a complete total package website. With more than 100+ configuration option, the theme lets you create any kind of website without writing a single line of code and with ease. With TotalPlus theme, we guarantee for an awesome online presence with visitor rapidly being engaged to the website. Viral is a minimalist WordPress Theme designed for professional blog, professional blogs, newspaper, news portals, publishing, corporate blogs, and editorial style websites. The theme has repeatable drag and drop section that allows adding as many sections as you want with various beautifully designed layouts. The theme consists of 3 unique banner layout to highlight your featured content, 6 unique category section layout, news ticker, promotional headline. Hamza Pro is beautifully designed minimalist, multi-purpose, feature-rich modern responsive theme. It is – Woocommerce, bbPress compatible, RTL supported, translation ready, cross-browser compatible and SEO friendly. RT Magazine Pro is a clean, well structured, sparkling, user-friendly, flexible, dynamic and attention-grabbing WordPress Magazine Theme with a sleek feel that’s perfect for news sites. Zincy Pro is a powerful & feature-rich business theme. It comes up with customizer panel which allows you to live preview your changes, configurations, settings, and design! It is super user-friendly, lightweight and saves a lot of setup/configuration time. Flash is the easiest, flexible, feature-rich and advanced free multipurpose WordPress theme we have ever built. Active users of this theme are growing rapidly.Flash is the one of the most popular Multi-Purpose WordPress theme for 2017 at WordPress.org with unlimited possibilities & currently empowers 10,000+ sites alone and counting.You can also get a free version of the theme. Maggie pro is clean & modern, minimalist, and premium WordPress magazine theme. It is ideal for a newspaper, editorial, online magazine, blog or personal website. It is a cutting-edge, feature-rich FREE WordPress theme and is fully-responsive. Its feature includes 2 post layout, author block, large featured images for page/post, social media integration for wider social reach. Suffice is beautifully designed. Comes with a demo for business, construction, food, app, gym, magazine, one-page, photography, portfolio etc. Premium version comes with additional numerous features. You can also get a free version of the theme. Eight Sec Pro theme is a premium WordPress one-page theme with eight sections and four widget area. It is ideal for business, corporate, portfolio, blog, agency, freelancer and any other modern and creative website. Himalayas is premium, modern style free one-page parallax responsive WordPress theme. Inform your visitors all they need to know right from your home page without requiring to go to the other pages. Himalayas can be used for business, portfolio, corporate, agency, photography, freelancers and almost any kind of one-page websites. You can also download its free version. Freedom is a simple, minimalist, clean and responsive stylish free photo blogging WordPress theme. This free WordPress theme has clean and beautiful typography.You get many features like advanced typography, translation ready, custom CSS. Realestate Base Pro is a clean and beautiful real estate WordPress theme. It is a flexible theme suitable for real estate agency, agents, builders, interior designers, architects, brokers and also useful for blog, business, corporate or portfolios website. It comes with powerful theme options and custom widgets which make customization easy and intuitive. In a matter of minutes, it helps you to set you up with sophisticated custom websites. Regardless of your previous development or coding experience, it delivers sharp, polished results. As this theme is responsive, it looks great on all size devices ranging from small phones to large monitors. ColorMag is most popular theme in the WordPress market. It is perfect responsive magazine WordPress theme for 2018. Fully compatible with Elementor page builder plugin to create various types of demos. Suitable for news, newspaper, magazine, blogging kind of sites. The perfect theme for bloggers and online publications. Powered by Divi Builder, Extra gives you the ultimate flexibility to create diverse categories, homepages, and story-driven posts.Extra. The Ultimate Magazine WordPress Theme. Accelerate is free minimal WordPress theme. Accelerate is best suitable for small-medium businesses. Also, suitable for clean personal blog site.Accelerate is one of the most popular Multipurpose Responsive WordPress theme at wordpress.org & currently empowers 20,000+ sites alone and counting. Laura is a feminine WordPress Fashion Blog for all the Bloggers out there who strive towards minimalism and simple colors (with pink and purple tones). Its retina ready and fully responsive design will look amazing and work fluently on all the devices, mobile, tablet, and desktop. To save time and start your online experience even easier and quicker, Laura comes with 6 pre-defined demos that you can install with one simple click of your mouse or trackpad. You can check all live demos in the preview below. Kalon Pro is a visually appealing feminine WordPress Theme with a clean layout and elegant design focused on readability and user experience. The Theme comes with offers full customization options with multiple layouts, navigations, headers, styles and many top-end features to build a unique blog. With a striking, beautiful design and great typography, Kalon Pro will immediately set your website apart from the competition. Business Field Pro is a responsive and clean business WordPress theme. It is versatile and high-performance theme with a modern creative design to suit a multitude of creative uses for building websites. It is ideal for businesses, agencies, corporations, and freelancers, who are looking to grow their business. The main concept behind this theme is a user-friendly environment that allows users to enjoy the clean and impressive design. It has a unique structure and simplified option panels so that you will be able to easily build a stunning website for your business. Agency X is responsive WordPress theme which can be used for web design firms or any other corporate, business, agencies, consulting, legal, attorney, law firms, online shops, digital, medical, clinic, dental, spa, beauty, massage, gym, fitness, trainer, coach, restaurant, cafe, food, recipes, technology and any other kind of website purpose. It can also be used for portfolio, photography, personal and blogging as well. This theme is simple, white, minimal, clean theme which can be used for web design firms or any other corporate, business, agencies, consulting, legal, attorney, law firms, online shops, digital, medical, clinic, dental, spa, beauty, massage, gym, fitness, trainer, coach, restaurant, cafe, food, recipes, technology and any other kind of website purpose. An original black-and-white minimalist WordPress theme for great portfolios and photography collections. This theme looks so simple and elegant, provides an upright menu, an author box, and an awesome project display, which acts as a slider. These are the list of 50 premium and minimalist themes which you can purchase for your great website. Some of the themes listed above are available for free.